On behalf of the French Defence procurement agency “Direction Générale de l’Armement” (DGA), OCCAR placed on January 30th a new Logistic Support Ship (LSS) contract for 1.7 b€ (VAT incl.). In accordance with the French Defence planning law 2019-2025, this contract will enable the French Navy to progressively phase out the current logistic fleet and commission 4 brand new vessels, the first two of which shall be delivered by 2025. From left to right: Mr Yves Pelpel, director of Navy Programmes, Chantiers de l’Atlantique; Arturo Alfonso Meiriño,Director of OCCAR; Mr Jean-Luc Ferrandi, Director of Sales of the Programme Direction, Naval Group©OCCAR. 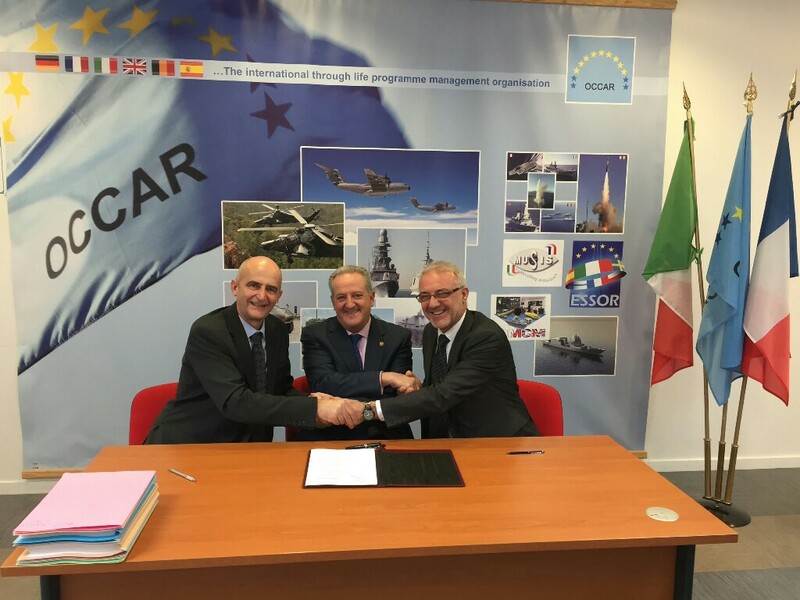 OCCAR already manages several joint programmes between Italy and France : either through bilateral cooperations (FREMM destroyers, FSAF-PAAMS anti-missile system), or via multilateral cooperations with other countries (MALE-RPAS medium-altitude long-endurance drones, ESSOR software-based radios).